SuperClubsoffers two beautiful golf courses that are both easily accessible from Whistling Villa. 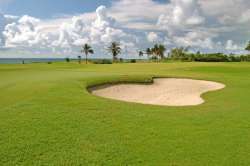 The PGA quality tournament course at Breezes Runaway Bay Resort & Golf Club also has a golf school right on the property. Grand Lido Braco Resort & Spa features the Village Green, a 9 hole par 3 course, to test your skill.SuperClubsrecently added the former Ironshore 18- hole course as the SuperClubsoffers Golf Club - Montego Bay. With its crisp breezes, rugged topography and breathtaking scenery, Jamaica may well be the best kept secret among golfers. Dunn's River Falls is unquestionably the most popular tourist attraction in Ocho Rios, Jamaica. The setting is truly breathtaking, and the incredible cascading falls challenge, refresh and delight visitors of all ages. 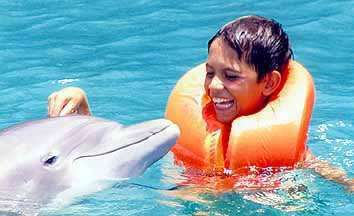 Swim with Dolphins , Swim with the Sharks, Interact with Stingrays (Barbs removed), Captain you own Mini-Boat or go Glass Bottom Kayaking on the Caribbean Ocean, enjoy a splash in the turquoise ocean or relax on the pearl white beach. "Jamaica's north coast has a very diverse coral reef" structure. Located on the edge of the Cayman Trench, incredible reef walls begin at 60 ft. and drop down to over 150ft. These walls are completely covered in a large variety of hard and soft corals. Beautiful elephant-ear, basket, tube, and rope sponge are found in beautiful colours of red, pink, yellow, and orange as well as enormous trees of black coral and gorgonia. The walls here have many overhangs and ledges for you to explore and see lobster, king crab, green and spotted moray eels, and a host of other marine creatures. 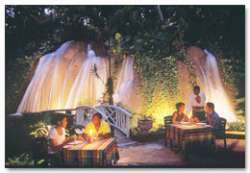 The Ruins is located just minutes away from the pier at Ocho Rios. This is a very special and exotic place, a tropical paradise centered around a waterfall that cascades into the Caribbean Sea. The ruins is open for lunch, historic tours, garden tours, and shopping for authentic Jamaican arts and craft in The Ruins Art Gallery and Gift Shoppe. 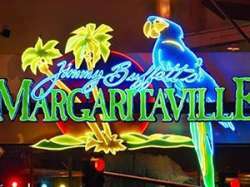 Opened in February 2002, Margaritaville Ocho Rios was formally christened by Jimmy himself when he and his band staged a beachside concert in front of an audience of loyal parrotheads, lucky tourists and local Jamaicans. At 12,000 square feet and seating 450 people, the Ochi location is biggest 'Ville ever, located in prime position on the beach at the Island Village shopping and entertainment complex, just steps away from the cruise ship pier. Prospect Plantation is a working agricultural property established in the 18th century. 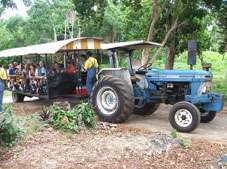 You will enjoy this tour by horseback and experience a Jamaican Plantation, where you will see bananas, cassava, sugar cane, coffee, all spice and many other crops. See Farmer Brown climb a 30ft Coconut Tree. The Blue Mountain Bicycle Tours offers downhill riding tour. It is a truly delightful bicycle trip, down the mountainsides and rolling hills, a grand way to see Jamaica. These tours are ideal for singles, couples or families who wish to experience and photograph the world's famous Jamaican Blue Mountains, Santa Cruz Mountains and the island culture and lush, tropical countryside - all while riding out in the fresh Jamaican air. 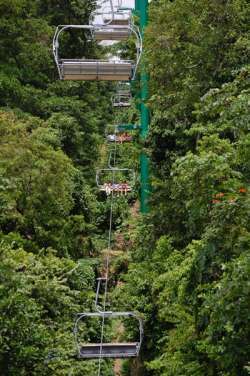 Upon arrival embark the Sky Explorer chairlift for a picturesque 15-minute ride through Jamaica's tropical canopy where several electrifying adventures await those hunting for the latest in Drive your very own bobsled down the mountain on the Jamaica Bobsled ride, Traverse the rainforest on the zip line adventure, glide down the waterslide to the infinity pool and dine to spectacular views at the R2 restaurant.Mystic Mountain offers a medley of different ways to experience the jungle that are guaranteed to get the whole family buzzing with pleasure. excitement. Welcome to An Evening on the Great River! 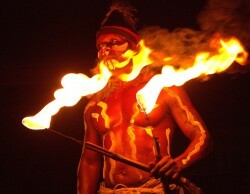 Come join us for a very unique, authentic Jamaican experience. Click here for further details and book your journey to the most exciting, new attraction that Jamaica has to offer. The Great River rises at about at about 1,400 feet (430m) just north of the small village of Pisgah in the NW corner of St. Elizabeth. 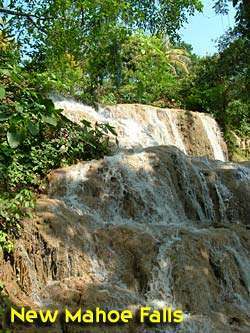 From here it flows NNE for about 57miles (92km) reaching the Caribbean Sea at Great River Bay on the island's north coast, which is about 4.5 miles (7.2 km) west of Montego Bay. The Great River is one of Jamaica's major rivers, which forms the boundary with St. James with Westmoreland and Hanover. Do you like crawfish? The Great River is the home to many. The second largest tree on the whole island is located at the Great River.